Since Microsoft Outlook uses PST files to store all kinds of objects - from notes and contacts to messages and calendar tasks - bulk exporting of objects to individual files and folders on the hard drive may turn out to be a serious problem. For instance, you may want to export some messages, save them in the HTML format on your hard drive and later upload them to your web server for public access. Or you may want to save a couple of hundred email messages in the RTF format for subsequent formatting and editing. Although you can theoretically do this manually, it will take you an inadequate amount of time to complete this task, so the only solution here would be to use an export automation tool, such as Outlook Export Wizard! 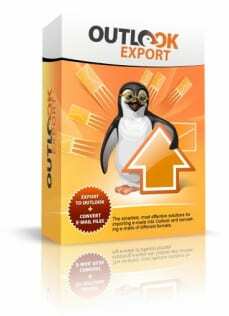 Outlook Export Wizard is a compact, flexible, functional and remarkably fast export tool that can be used for exporting all kinds of objects from Outlook PST files and creating full backups of PST file data. The software supports plenty of output formats, including EML, MSG, RTF, HTML, VCF (vCard), TXT, MHT, VCS (vCalendar), iCS (iCalendar) and TNEF. Outlook Export Wizard can work in an automatic mode and determine the necessary output format to be used for the files being exported. Items can be extracted from an existing Outlook profile or a separate PST file. The intuitive interface of the program is based on the concept of a step-by-step wizard and consists of only 3 easy steps: selection of the source file and the destination folder, data preview and data extraction. Outlook Export Wizard will help you perform a migration of your Outlook messages into &quot;The Bat!&quot; and other RFC822-based email clients, back up entire PST files preserving their folder structure, as well as export specific items, such as calendar tasks and notes, and save them for further importing into third-party solutions. Statement: First, please download the orginal installation package by clicking the download link. Of course you may also download it from the publisher's website. Using Outlook Export Wizard crack, key, patch, serial number, registration code, keygen is illegal. The download file hosted at publisher website. We do not provide any download link points to Rapidshare, Hotfile, Depositfiles, Mediafire, Filefactory, etc. or obtained from file sharing programs such as Limewire, Kazaa, Imesh, Ares, BearShare, BitTorrent, WinMX etc. Software piracy is theft. If you like Outlook Export Wizard please buy it.